Well, no, I'm not back in the studio making work yet, but apparently someone was so desperate to get in, that they broke a window, cut themselves climbing through and set off my burglar alarm. What excitement!! Luckily the police are very good in my area and always arrive promptly and my friends at home got the window immediately replaced and Jim was a champion for taking care of the alarm details. Great friends are a treasure indeed. Looks like nothing was taken, they were just hoping for money.........HA! That was a big strike out. 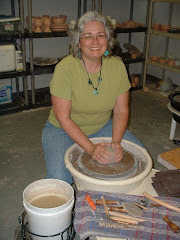 Guess they'll take pottery studios off their potential "cash cow" burglary candidate lists. Of course, my main concern, once it was apparent that everything else was ok was "Did they knock over my bookshelves getting through the window or bleed on my favorite pottery books? Thank goodness for all the great, honest people in the world. You have to keep that in mind when a random act of unkindness happens to you. Three cheers for nice people!